If Scotland leaves the European Union because of an English vote in the United Kingdom’s referendum on EU membership, the backlash could result in another Scottish UK independence vote, Nicola Sturgeon said today (2 June). The SNP leader called for the vote to require a “double majority” where England, Scotland, Wales and Northern Ireland would individually have to back “Brexit” for it to go ahead. Sturgeon’s Scottish National Party (SNP) has enjoyed a surge in popularity since it led a failed bid for independence last year, winning all but three of Scotland’s 59 parliamentary seats in May’s general election. “If Scotland were to be taken out of the EU despite having voted to remain, it would provoke a strong backlash,” the First Minister of Scotland warned during a speech in Brussels. That could only be avoided by agreeing to double majority. Doing so would make claims made during the Scottish independence campaign that the UK was a “family of nations” much more credible, she added. Ian Duncan is a Scottish Conservative member of the European Parliament. He said that double majority would create a democratic deficit, with the votes of some citizens in the UK being worth more than others. “Last September, the people of Scotland voted to remain in the United Kingdom, knowing full well an EU referendum was likely,” he said. Sturgeon said that her government would push for a much stronger influence and say over UK decision-making on EU affairs, as part of the “devolution max” talks between Edinburgh and London promised after Scotland’s independence referendum. “We want a much stronger and more formalised position,” she said. EU policy areas that particularly affected Scotland, such as fishing, would be targeted. The SNP also wanted to make it possible for a Scottish government minister to lead UK talks with EU diplomats, if the UK minister was not available. In the past, civil servants had led discussions even when a Scottish minister was present, Sturgeon told EURACTIV. “The Scottish Government has become obsessed by who is in the room at the Council, and has forgotten about the European Parliament,” Scottish Conservative MEP Ian Duncan told EURACTIV. Sturgeon criticised the decision to block EU residents in Britain from voting in the Brexit referendum as “unfair, undemocratic and unjustifiable”. The Scottish independence referendum was open to EU and Commonwealth citizens resident in Scotland. She backed EU reforms, including the European Commission’s “better regulation” push to cut red tape, but warned that they needed to be negotiated sensibly. Cameron is pushing for the reforms ahead of the Brexit referendum. He had promised the vote by 2017 if he won last May’s national elections. “Although it has been 29 months since the Prime Minister announced his intention to negotiate reforms, we still have very little ideas of the specific changes he wants to see,” Sturgeon said. Because of that, it was impossible to know to what extent the SNP and the Conservatives agreed, she added. Treaty change, which Cameron wants, was not needed to deliver those reforms, Sturgeon said, before signalling that she would not support any changes to the EU right of freedom of movement for citizens. 170,000 citizens of other member states live and work in Scotland and made a valuable contribution to society, she said, and many Scottish citizens lived in the EU. 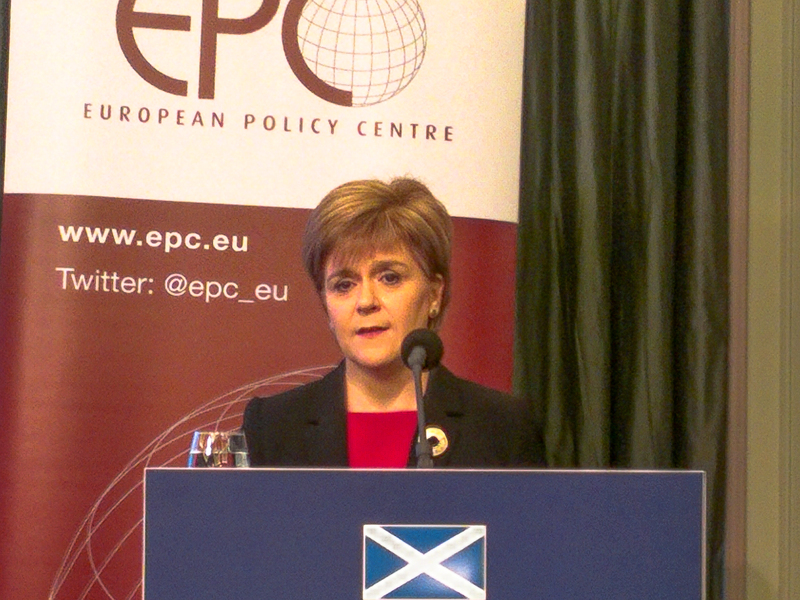 Sturgeon backs “sensible proposals” for reform of the EU within the existing treaty framework. Raises minimum pricing issue. 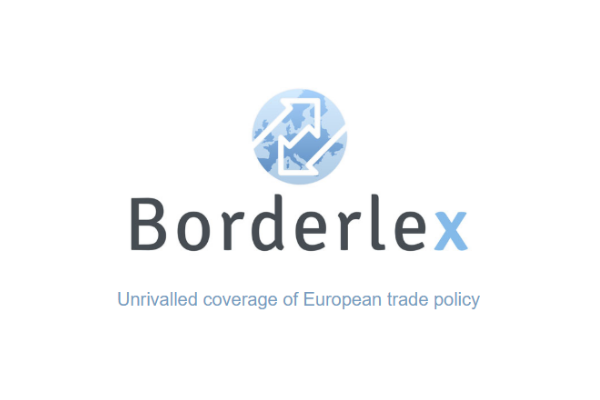 Immigration and freedom of movement were major political flashpoints during the UK’s general election, with Cameron toughening his position in response to the threat posed by the Eurosceptic UK Independence Party to his Conservatives. “Some UK government rhetoric creates the impression that EU membership is not beneficial at present, (that) it will only become beneficial if there are reforms,” said Sturgeon. That created a danger that the focus would be on the size on any reforms rather than the bigger picture of the value and importance of the EU. If the UK government wants to remain in the EU, it should give people something to vote for instead of focusing on the risks of leaving, she said. “The SNP has made a dramatic U-turn today after cheerleading for the EU during the independence referendum,” said MEP Duncan. Sturgeon attacked David Cameron’s push to take the UK out of the European Convention on Human Rights and replace it with a “British Bill of Rights”. “It defies belief that any politician would try to distance the UK from the Convention,” Sturgeon said before warning SNP MPs in Westminster would robustly oppose any attempts to weaken it. “Scotland’s commitment to the EU is matched to its commitment to the Convention,” she added. Sturgeon also declared, to applause at the European Policy Centre event, that Scotland recognised its duty to refugees. Scotland was ready to resettle some refugees, as part of the relocation program being championed by Commission President Jean-Claude Juncker in the wake of hundreds of migrant deaths in the Mediterranean. Sturgeon told a mix of EU officials, press and politicians that she did not expect Scotland to adopt the euro in her lifetime. During the Scottish independence campaign, Union supporters warned that Scotland would not be able to keep the pound in the event of a yes vote. They also insited that if Scotland left the UK, it would have to accede to the EU all over again. Sturgeon insisted that while Euroscepticism did exist in Scotland, it was not a priority for people. “Euroscepticism exists in Scotland […] but in my view not to the same extent or virulence we sometimes see in the UK,” she said. Sturgeon’s warning that Brexit could trigger another Scottish independence vote echoes that made before by leading Conservative MEPs. David Cameron's surprise victory in the United Kingdom’s general election has put Britain on course to hold a referendum on its membership of the European Union, and raises questions over Scotland’s future in the UK. The Conservatives promised an in/out referendum on EU membership before the end of 2017 if they win the election, placing Europe's future at the centre of the debate. The pro-EU Scottish National Party (SNP) took all but three Westminster seats in Scotland in a stunning victory at the same election. The SNP’s crushing victory came just eight months after Scots voted yes to staying in the UK. The yes victory led to Alex Salmond stepping down as SNP leader and First Minister of Scotland, with Nicola Sturgeon taking over both posts. Empty threat from Nicola who only represents half of Scotland & many of those she does represent still don’t want the EU either & she & the SNP have made it perfectly clear they are pushing for Independence anyway no matter what the rest of the Union does. She also now claims she can take power back from the EU so either she’s lying to the Scots or completely ignorant as you can’t take power back as the treaty’s are quite clear once power has been ceded to Brussels they can never ever be returned unless they reopen the Lisbon Treaty & ALL other members of the EU have to agree or by the Nuclear option of enacting Article 50 & leaving the EU outright. Her plans are doomed to failure from the start & she knows dam well membership means surrendering all financial control & all aspects of life in the state of Scotland with Holyrood just being an administrative branch of Brussels with only the power to control minor local laws. Let’s for a moment forget that polls have shown Scots can be just as Eurosceptic as the rest of us and go along with the SNP narrative they are all hugely happy with the EU as it is, even though Ms Sturgeon herself is now calling for reform. (What exactly does she want and what will her position be if it is refused?) Let’s forget that a majority of Scots want a vote on EU membership ( https://www.ipsos-mori.com/researchpublications/researcharchive/3131/Scots-want-EU-referendum-but-would-vote-to-stay-in.aspx ) and that a majority do not want a second referendum on independence (http://www.dailyrecord.co.uk/news/politics/general-election-2015-51-scots-5600145 ) and consider what Ms Sturgeon has said. What follows now is just for illustrative purposes and is in no way predictive. The UK electorate number about 46.4m with 4.1m of those being Scottish. Let’s assume 70% turn out across the entire UK excluding Scotland. Of those, pretend 55% support UK exit (16.28m) and 45% are against (13.32m). Now let’s assume 80% of Scots turn out and only 30% want to leave (0.98m) while 70% want to stay in (2.29m). There would then be a clear majority to leave the EU 52.5% to 47.5%. Yet this result is to be set aside ? A cynic might suggest that this is designed purely to create anger elsewhere in these islands. A second question, even assuming a newly independent Scotland can join the EU with a euro opt out (unlikely), and if Ms Sturgeon does not expect to see Scotland using the euro in her life time, how seriously does she think the views of Scotland will be taken against those of euro members of similar size? The only fault with your argument is that the UK electorate (excluding Scotland) still includes Wales and Northern Ireland — both of them in favour of staying within the EU because they have received a lot of regional support from the EU and also for a whole set of political reasons. Apply the same logic as above to the population of 4.9m which Wales and NI have together (in more conservative terms than in the case of Scotland, say around 55% voting to stay in and 45% to leave) — then you have another 1.9m shift in the “staying in” direction, which would change the majority to that side. I hope I made it clear in my earlier post that all the numbers were entirely fictitious and purely for illustration. The point about my little scenario was to show the very really problems with the double lock Ms Sturgeon is proposing. I accept entirely that it is possible the referendum could go either way, and it is also possible that when the number crunching is complete we could find out that a constituent part of the UK has voted one way but is in a minority overall. The same could also be true of identifiable parts of the four nations. So for example (again for illustration only and with no basis in fact) pretend London votes to stay in, while the Orkney Isles votes to leave. But the overall the majority across the UK is to leave, while in Scotland (taken in isolation) EU supporters won. How does all this fit into a double lock process? By the way please don’t assume that Wales is significantly different from the rest of the UK in respects of support or otherwise for the EU. The following links suggest that it could go either way. With regards to Northern Ireland, strangely given the opposite communities they represent, the DUP, Ulster Unionists and the Nationalist Sinn Fein have all traditionally adopted a Eurosceptic stance. While it is possible that one or more of these parties may in the referendum decide to support a ‘renegotiated deal’, the point remains that as with the UK in general, it is an error to think they are inherently pro EU. Finally with regards to the cohesion support that the different parts of the UK receive from the EU, please remember that given the UK is a net contributor all this EU largesse originates from the UK. There is however the estimated 4% administration cost of EU handling of these funds. It is therefore entirely possible that by leaving the EU, regional funding could actually increase significantly without requiring extra taxes etc. This is before you start to consider what we would want to do with the approx. £12.97bn (ONS figs for 2013) net per annum that we would no longer have to pay in membership fees. Scotland feels it can proudly stand on it’s own two feet and negotiate it’s own terms and relationship with the EU, good luck to them. There are a number of regions that are looking for independence and that sentiment is not about to change. There is an obvious drive for greater flexibility of membership and that should apply to all , including Scotland. I understand that the SNP want Scottish independence, but think it is a bad idea for the UK. However, what I don’t understand is that the EU is continuously seeking closer union with the loss of sovereign powers, but the SNP want to be part of it. Have I missed something here? SNP want independence to hand sovereign powers over to the EU? Scots nationalism is based on a hatred of the English, nothing more. If the English were Europhiles, the SNP would be Eurosceptic. It’s that simple. FYI — polls demonstrate the Scots are only slightly less Eurosceptic than the English. This line about the Scots (as opposed to SNP) being pro-European is a myth. I get that, but very subjective to how people may or may not vote. Scotland voted to stay within the UK, so any referendum should be across the whole of the UK, as one. Otherwise you could have any region complaining they wanted in when the overall majority want out. My view is that the UK has remained in turmoil because we have never had a say since the original referendum in the early 70’s. Our democracy needs to change and Parliamentary Sovereignty needs to be removed. Major decisions regarding Sovereignty need to be made by the people not by what MP’s decide. What may be best may not be what the people want and I think the British people want their say, but it should be as one. for over 400 years Scotland has wanted to go its own way may be they should stand on there own. then they can stop blaming the English for every thing wrong.